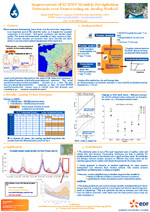 An Outstanding Poster Award will be given at the 10th EMS / 8th ECAC in Zürich. Svetlana Reneva being presented the Outstanding Poster Award. Laurant Dubus could not be at the award presentation. The contribution is a clear and concise presentation of an important aspect of climatic change, namely a possible increased release of methane in the Russian Arcitc, a topic of high relevance for the living conditions in this sensitive environment. The contribution tackles an issue of high significance with an appropriate use of up-to-date forecasting tools and nevertheless presents the results in an easily understandable manner. Sylvain Joffre, Finnish Meteorological Institute. Clarity/fluency to have the message through to the readers. The author(s) receive one registration fee waiver for the EMS & ECAM 2011 in Berlin, and the posters will be highlighted on the EMS website as example of Best Practice.